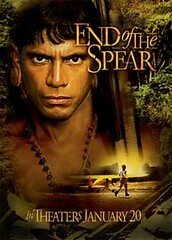 Last night, Esther, Markus, Calvin and I saw 'End of the Spear' It was a great movie--different than what I expected. Being familiar with the books, "The Shadow of the Almighty' and 'Through Gates of Slendor', I expected the movie to focus on Jim Elliot. But instead, it focused on the pilot and his son. The reason why made sense in the end. The film did a great job of explaining what went on in the Waodani tribe before and after the killings. The message of the gospel was implicit in the story which makes it more powerful to a seculat audience. I would definitely recommend seeing it, if you can find it! We had to drive to Puyallup to see it. "Whoever professes me before men"